Do you enjoy golf? Are you looking to play golf without the worry of rain spoiling your day? If this is you, then Paphos is a place to consider as your place to retire, raise a family or vacation. Whether you live east or west of Paphos you will find a great golf course nearby. "Cul-de-Sac w/ Sea Views - Large Plot"
"Title Deeds & Sea Views"
"Easy Access To The Village Square"
Aphrodite hills resort is the home of the most recognized and arguably the best 18 hole golf course in Cyprus. Located 10 minutes from the Paphos International Airport and just above Petra tou Romiou you will find luxury property and accommodation, a clubhouse and golf shop with an extensive range of equipment and apparel. You will also find fine dining at the restaurant with Cypriot and international dishes that can be enjoyed along with the views overlooking the Mediterranean sea. Also available at Aphrodite Hills is a Golf Academy with professional instructors for anyone who seeks to improve their game. The course is 6,299 metres long and was designed by Cabell Robinson, an American Golf course architect. And after a day of golf, you can visit the Aphrodite Hills Retreat Spa for some indulgent and totally relaxing treatments or a massage. One of the most prestigous and stunning golf courses you will find is also the newest in Paphos designed by Sir Nick Faldo. 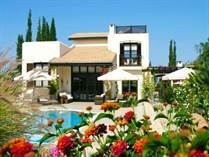 The Elea Estate Golf Course opened in 2011 near Yeroskipou just outside of Paphos town. The par 71, 81 hole course has a true Mediterranean feel and incorporates the most stunning scenery. 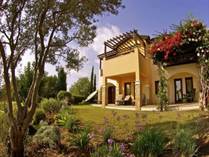 This is truly a unique course and great choice in Paphos to spend a day at or make it a life as there are some stunning, newly constructed properties for sale there. The clubhouse there is fantastic and also incorporates several restaurants, bars, a library, a cozy fireplace for the winter and a place to relax or get to know your neighbours and other members. It is the hub around which everything takes place. Just across a ravine from the Aphrodite Hills course is the Secret Vally Golf Club that also sits on top of a mountain with spectacular views of the Mediterranean sea. The course is 5,904 metres and also offers a clubhouse with a shop and restaurant to enjoy the spectacular views. On the other side of Paphos you can enjoy playing at the Tsada Golf Club, another 18 hole course that is nestled at 550m above sea level. You can find all the amenities that you can think of from a clubhouse and restaurant to driving range, swimming pool, carts and a golf shop. The location of the Tsada course is attractive due to it's proximity to the popular village of Tala and the popular resort and beach of Coral Bay.